What is the Watchman Device (Also known as Watchman Procedure, Watchman Heart Procedure or Watchman Implant)? The Watchman Device is a small implant placed in to the heart that can reduce the risk of stroke in patients with atrial fibrillation. Patients with atrial fibrillation are at increased risk of stroke, mainly due to clots that form in a small chamber in the top of the heart known as the left atrial appendage. In the Watchman procedure a small tube is passed up to this appendage through the veins of the leg and the watchman device is deployed, closing off the appendage. For this reason the Watchman procedure with the Watchman Device is known as a form of left atrial appendage occlusion. The Watchman procedure is a structural heart procedure such as the TAVR procedure for aortic stenosis or the Mitraclip procedure for mitral regurgitation. How does the Watchman Device reduce stroke risk? The left atrial appendage is a small sac in the top left chamber of the heart. In people with atrial fibrillation, this sac quivers constantly, the blood in the sac becomes stagnant as a result, and clots can form in it known as left atrial appendage clots. These clots can get loose and travel to the brain leading to strokes. Atrial fibrillation is the most common cause of stroke and the majority of strokes in atrial fibrillation are caused by these appendage clots. Implanting the Watchman Device in to the left atrial appendage basically closes off the appendage and prevents any clots forming inside. In this section we will describe the procedure using images as seen below. The images are as obtained from Boston Scientific Original information videos. The goal here is for patients and healthcare providers who aren’t familiar with the Watchman procedure to be able to understand it more easily. The Watchman Procedure is a minimally invasive procedure performed through the vessels of the leg. Firstly, access to the leg vessel is obtained through a small needle and a wire. The patient will not feel this, as they are asleep. A tube is passed up through the vein of the leg, to the right side of the heart. Remember the left atrial appendage is on the left side of the heart. The tube is passed from the right to the left side of the heart by puncturing the wall between the right and left side of the heart known as the inter-atrial septum. This is called a transseptal puncture. The whole goal of the Watchman Procedure is to close off the left atrial appendage. The appendage is where the clots form that lead to stroke in patients with atrial fibrillation. In this next portion of the procedure, the tube through which we will deliver the Watchman Device is placed in to the appendage. The tube is positioned using a catheter known as a pigtail catheter that is soft and unlikely to cause damage to the heart structures. The device is advanced to the appendage through the tube. When in place the tube is slowly pulled backwards and the Watchman Device takes shape in the mouth of the appendage until it is fully expanded in place. At this point a number of checks are performed to ensure the device stability. As part of the checks to make sure the device is nicely in place and stable the Watchman device is gently tugged on to make sure is stays in place and isn’t loose. This is called a tug test. There are small anchors in the device that keep it in place also. The Watchman Device is still attached to a delivery cord. This cord is removed by gently unscrewing the cord until the device is detached. Of course prior to detaching the device, a number of checks have been performed to ensure that the device is stable and in correct position. The device is nicely in place and over the next weeks to months a process occurs whereby the body covers the device with its own lining known as Endothelialization. This is great for a few reasons. Firstly, this ensures the device will essentially remain stable lifelong. Secondly, this will further act to prevent clot formation in and around the appendage. Who should be considered for a Watchman Device? Historically patients with atrial fibrillation that were considered to be of a high stroke risk were treated with blood thinning medications such as Coumadin / Warfarin to reduce stroke risk. As things stand, use of blood thinner is the preferred treatment for patients with atrial fibrillation. Almost half of patients with atrial fibrillation cannot tolerate the blood thinner. Some of the reasons for this include bleeding issues, concerns for falling, lifestyle issues and inability to tolerate the medication. In such patients, the Watchman Device is felt to be a good alternative to reduce stroke risk. Who is a Watchman Device Candidate? Firstly lets look at the official guidelines then we can discuss this in a little more detail in a way that patients can understand. In order to be a candidate for the Watchman Device, the following criteria need all to be fulfilled. Increased risk for stroke and systemic embolism based on CHADS2 or CHA2DS2-VASc scores and are recommended for anticoagulation therapy. Appropriate rationale to seek a non-pharmacologic alternative to warfarin, taking into account the safety and effectiveness of the device compared to warfarin. Firstly, patients must be at increased risk for stroke. When we are determining stroke risk for atrial fibrillation patients we use scoring systems known as the CHADS2 score or the CHA2DS2-VASc score. To determine these scores we basically put numbers in to the scoring calculator. Let me take you through an example. So, if we had a patient that is 75 years old (1 point), and has a history of high blood pressure (1 point) and diabetes (1 point), this gives us 3 points and therefore a CHADS2 score of 3. In general those with a CHADS2 score ≥2 or a CHA2DS2-VASc score ≥3 are considered high risk of stroke and conventionally would be treated with blood thinning medications. Secondly, patients must be deemed suitable candidates for warfarin. You have to at least be able to tolerate warfarin for 45 days after the procedure during the endothelialization process. You will then need to take another type of blood thinner known as Plavix, or clopidogrel, for another 6 months. Thirdly, there must be appropriate rationale to seek a non-pharmacologic alternative to warfarin, taking into account the safety and effectiveness of the Watchman Device compared to warfarin. Now remember the first line treatment for atrial fibrillation patients considered at high risk of stroke is the use of blood thinning medications such as warfarin. The Watchman Device is for those who are felt to be unsuitable for long-term treatment with blood thinners. Later in the section “what does a Watchman patient look like” we go through some different scenarios. Examples would be patients who have had a bleed or are at high risk for bleed for various reasons. Or a patient who is at high risk of falling or has a history of falls for whom blood thinners are too dangerous. Or a patient who has a lifestyle incompatible with the use of daily blood thinning medication. Regardless, there must be an appropriate rationale for the patients not being on long-term blood thinning medication. The Watchman Procedure – Does Appendage Type Matter? The Watchman Device is designed to cover and essentially eliminate the appendage, basically preventing clots from forming there and reducing stroke risk. The video below shows the three main appendage types. Chicken-wing, broccoli and windsock types. Yes these names appear ridiculous when describing anatomy however they accurately describe the shape of the appendage. The easiest to do is the windsock type, as this is easier to deliver. The chicken wing can sometimes be straightforward and sometimes more difficult. The broccoli is felt to be the most difficult. Regardless successful use of the Watchman Device has been described in all these circumstances. The Watchman Procedure – Does Appendage Size Matter? There are 2 important things when considering appendage size, the width of the entrance and the length of the whole thing. The width is important, as the chosen device must cover the whole opening to seal off the appendage. The length is important, as it must be long enough to deliver the chosen device. The good thing is the device comes in many sizes. 21mm, 24mm, 27mm, 30mm and 33mm. The length of the appendage must equal the maximum size of the appendage opening to be able to accommodate delivery of the device. Why don’t all patients with atrial fibrillation have the Watchman Device implanted? The recommendation for the use of the Watchman device is based on evidence gathered over many years and in thousands and thousands of patients. As things stand, the evidence is there only for patients that don’t tolerate blood thinner. There is no good evidence currently that atrial fibrillation who are doing well taking blood thinning medication should have the Watchman Device implanted. Who Should Not Get a Watchman Device? Even in those patients who have already fulfilled the above criteria, the Watchman Device should not be used in the following groups of patients. Intracardiac thrombus is visualized by echocardiographic imaging. This means that patients who have been found to have clots in the heart should not have the device. This is because the Watchman Procedure itself would be associated with a high risk of the clot dislodging and a stroke or other major complication. An atrial septal defect repair or closure device or a patent foramen ovale repair or closure device is present. In patients that have had a history of a hole in the heart and a device already used to close it, the Watchman Procedure is not typically a good idea as the existing device will simply get in the way of the procedure. The LAA anatomy will not accommodate a device. 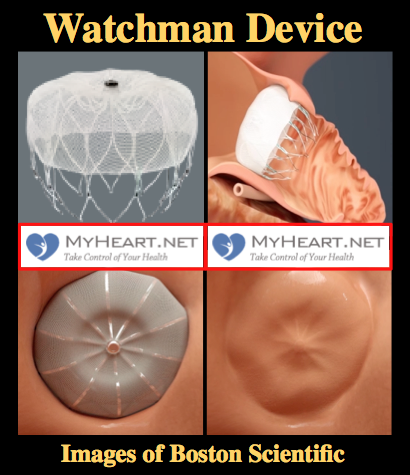 Remember the Watchman Device is designed for placement in the left atrial appendage. Although in most cases the size and shape of the appendage is ok, in some cases it is not able to accommodate the device. This should be known prior to the procedure. Miscellaneous reasons. Reasons may include inability to use a TEE probe for imaging, the presence of active bleeding or infection, anatomy that does not allow catheters to be used appropriately, the patient has a hypersensitivity to the components of the device, etc. Patients should typically be able to use aspirin or Plavix. What are the proposed advantages of the Watchman Device Implant? Patients with the Watchman Device can typically stop strong blood thinning medication such as Coumadin 45 days after the device is implanted therefore decreasing the chance of bleeding complications and the need to take daily medicines. There is the reduced cost associated with not needing to take a lifetime worth of blood thinner. Who performs the Watchman Procedure and where should you have it done? The Watchman Procedure is a unique procedure in that it requires a unique approach called a heart team with structural heart training. A heart team for the Watchman Device typically includes interventional cardiologists, electrophysiologists, imaging specialists and other specialists to work in combination. The procedural selection, planning, and performance rely on these specialists working together. For this reason the Watchman Procedure should only be performed in a place with an established heart team in place and strong individual programs in all these aspects. Every part of the procedure is critical, including the pre-procedural selection and imaging, and all contribute to achieving a positive outcome. The correct team and approach leads to reduced complications and improved outcomes. How long does a Watchman Device last? Thousands and thousands of Watchman Devices have been implanted over the last decade worldwide and data regarding the durability of the Watchman Implant is accumulating. Shortly after placement the body’s own lining covers the device, essentially incorporating it into the body. Essentially if correctly done, the procedure should last lifelong with regards to occlusion of the left atrial appendage. What tests are required for the Watchman Procedure? Initially the Watchman Heart team evaluates each patient with atrial fibrillation and determines the suitability on a case-by-case basis. Once that has been determined then other tests are performed to assess suitability for implantation of the Watchman Device. Typically an ultrasound scan of the heart known as a TEE is performed to assess the left atrial appendage and to help select sizing of the Watchman Device. In many cases CT scanning may be performed to allow assessment of the heart to determine left atrial appendage type and size, and also to assess the approach taken. How long will a Watchman Device patient have to stay in the hospital after Watchman Implantation? As Watchman technology and experience continues to evolve the length of hospital stays are growing shorted and shorter. Typically patients leave the hospital the day after the procedure. What medications need to be taken after a Watchman Device Procedure? The point of the Watchman Device implant is to avoid the need for blood thinning medication. As things stand, the blood thinning medication Coumadin needs to be taken for 45 days after the procedure. This is because it is felt that until this time the device has not been covered by the body’s own lining and so there is still risk of clot formation. In the years to come, the need for strong blood thinner after the procedure may disappear all together. What are limitations After a Watchman Procedure? The limitations are minimal. In terms of activity you may be told to take it easy for a day or so to prevent bleeding issues from the vessels of the leg the device was placed through. There are the usual limitations and care needed for patients that take blood thinner, in that anything with more than an ordinary risk of bleeding should be avoided until the blood thinner can be stopped. What is the Watchman Device made out of? The Watchman Device is made out of a metallic frame that is then covered with a thin layer of fabric. It is extremely lightweight. The frame is made out of a nitinol alloy that is very common with cardiac implants. The fabric is made from Polyethylene Terephthalate (PET) and is attached by tiny sutures. Can patients have MRI scans or go in metal detectors with a Watchman Device? Patients can safely go through metal detectors. Patients can have MRI scans under the conditions listed on their implant cards. If patients are to undergo MRI scans then they should first hand their card to the radiologist and ensure the conditions are met. Remember one of the key goals of the procedure is to avoid the long-term use of often-undesirable blood thinning medications such as warfarin. As things currently stand patients will need to stay on warfarin for 45 days post procedure. The INR range is between 2-3. Patients will continue to stay on aspirin 81mg during this time. In most cases warfarin can be stopped at the 45-day point. It is possible in the future that there will be no need for warfarin after the procedure at all. In general, after the Warfarin has been stopped, the aspirin dose will be increased to 325 mg and Plavix 75 mg daily is started also until the 6-month point. After 6-months usually aspirin alone is given at 325 mg daily. At 45 days after the procedure a TEE test is performed; remember this is the small camera inserted in to the food pipe to get close images of the heart. The test is performed to ensure the Watchman device remains well positioned and continues to do its job. As with any invasive procedure there are risks associated. The good news is that the risk of complication is small, and has continued to decrease as the cardiologists performing and planning the procedure have continued to gain experience and make the procedure safer. Damage to the leg vessels – Remember the procedure is carried out through the vessels of the leg and there is a small chance of damage here. If there is damage, then this can usually be taken care of without too much difficulty. Infection – Antibiotics are given appropriately to minimize any risk. Infection could theoretically occur at the entrance site on the leg or on the device itself; this would be extremely rare, however. Damage to the heart structures – The heart structures are often thin and there is always a chance of causing tears in the heart linings and escape of fluid in to the sac around the heart, known as a pericardial effusion. In some cases this would require emergency surgery or at least insertion of a drain in to the sac around the heart. In experienced hands this is a rare complication. Device Embolization – The Watchman Device, if not seated properly, could theoretically come loose and essentially float freely until it became trapped in a heart structure. This would typically require cardiac surgery to retrieve the device. The good news is that with an extensive procedural checklist in place to ensure the device is stable, this complication hardly ever occurs. Although clinical trials gave us important data that led to approval of the Watchman Procedure by the FDA, it’s important to know the real life experience that can give us important insight into the safety and effectiveness of the procedure. The paper reported on the outcomes of almost 4000 cases in the United States. The implantation of the Watchman Device was successful 96% of cases. The procedure took around 50 minutes on average. The rate of fluid build up around the heart was 1% and of that 1% one-third required emergency surgery. The rate of the device coming loose was very low at 0.25%. In total there were only 3 procedure related deaths, which is 0.078%. These findings tell us that since FDA approval of the Watchman Procedure, it has in general been performed successfully in an efficient manner and the rate of complication is remarkably low. My Dad recently received a Watchman. Since the procedure, he has had to receive blood twice within the first 60 days due to low CBC’s. He has had endoscopy, colonoscopy, and various other tests to find where blood loss is. Nothing found. This was the main reason for having the device implanted. He was having to get blood approx. every 6-8 weeks. Typically after 45 days the blood thinner Coumadin can be stopped. This then allows patients at high risk of stroke to stop blood thinner while still being at low risk of having a stroke. The watchman is designed for this purpose exactly, to allow those at a high risk of complications from blood thinner to be able to stop taking it while still being protected. I am a 77 year old female and have been selected to have the Watchman device inserted but I have an issue. I have an abdominal venial problems in that born with non-functional structures and veins that bleed out when on Coumadin. An ablation was once suggested until the cardiologist saw my history of bleeding and that thwarted the procedure. I also have had aortic valve replacement surgery as well as three stents and two cabbage procedures. I am in Afib often and have had two strokes and a number of TIA’s. Last two visits to my cardiologist and even during the echocardiogram I was in AFib. My current cardiologist tells me I will not need to be on Coumadin after the Watchmen procedure but would need to continue on Plavix for a while afterward. I am confused. Might you offer me advice. It differs from situation to situation. In most cases its required the patient needs to be on Coumadin for 45 days after the procedure then after that switch to aspirin and plavix until 6 months then aspirin alone. In Europe, Coumadin is typically not used after the watchman procedure, simply aspirin and plavix. In the US, as things stand, Coumadin for 45 days after the procedure then after that switch to aspirin and plavix until 6 months then aspirin alone is the typical protocol. There are exceptions that need amendments to that protocol that are on a case by case basis and need to be discussed with the implanting team. At 45 days and at 1 year there is a TEE test to evaluate. So far so good with the work performed on me March 14th.. would a protected blue parking parking validation to be placed any place I need parking . It depends on the type of leak noted and its felt significance. Its something to discuss with the treating team. There have been instances described of placement of further devices in significant leaks although evidence for such a strategy is lacking. Tonya my husband has not had this procedure done but has had an artificial heart valve taking Warfarin. When in the hospital for something else they added an 81 mg. Aspirin to his medications. Ever since he has had IB. Transfusions every two weeks. After doing a video endoscopy they discovered the leak in his small intestine. Are there restrictions after the Watchman procedure? I.e. How long is the wait until you can lift, say, 30 lbs? How long before you can walk and resume normal activity? Any required bed rest? I was told that I may need to take plavix for about 45 days. Is Plavix equivalent to Coumadin? In general we give coumadin for 45 days after the watchman procedure. In some cases people cant do that so we have to stop the coumadin and give plavix. In terms of activity levels walking is fine in general the day after, and after the 1 week visit normal activity is typically resumed. Does one have to stop taking coumadin for 5 days prior to the Watchman implant? Its different in every case and is a decision made by the implanting heart team. Many will discontinue Coumadin a few days prior and the INR level checked prior to the procedure. In some cases there will be peri-procedural bridging with lovenox, (mechanical heart valves for example). My Mother is almost 87 and has AFib. She recently had a stroke and was airlifted to Sunrise Hospital in Las Vegas. The cardiologists there strongly recommended the Watchman procedure for her. In fact, she had the first part of it done while a patient there for 2 weeks. They want her to schedule the procedure to be done there in Vegas. Her cardiologist in Arizona does not recommend it. He says it is too risky at her age. She has had several small strokes since being hospitalized in April. What do you think of this procedure for somebody almost 87? In my watchman program every patient is examined by myself, the electrophysiologist, and a non implanting physician. We then determine risk vs. benefit. If a patient is felt to be a candidate we proceed with a TEE test to see if they are suitable in terms of anatomy. Age itself is not a contraindication. Even at 87 there may be significant benefit, and the procedure can be done safely in the right hands. Its difficult to say more without knowing the whole situation and health status of your mother but be sure to discuss the risk vs. benefit with the implanting team. If you other Dr feels she is too high risk also be sure to discuss things including reason for high risk, and their familiarity with the procedure itself. If unsure you should seek a second opinion from an implanting site. Would my mother be a canidate for the Watchman with a lung problem. She is diagnosed with AFIB but also has Histoplasmosis, also lung lymph nodes are calcified. When she coughs, many times bleeds. Her doctor said she can’t have a warfarin. She certainly could be evaluated by a Watchman team. She appears to have reasonable rationale to pursue alternatives to blood thinning medication such as the Watchman device. My mother has AFIB & Histoplasmosis with calcified lymph nodes in the lung. This causes her to bleed occasionally when she coughs. She’s been taken off of warfain. Would she be a candidate for the Watchman? Can you have any type of surgery on your heart if you have the watchman? My brother is checking in to having this done. I have been you told you can not have any heart surgery with this device. The watchman device is not a contraindication to heart surgery. In April 2016 I had a Bi-Ventricular Pacemaker by St Jude implanted. Last week based on an electrocardiogram Cardiologist determined need for an angiogram since I unable to complete stress test and results of chemical test not clear. Based on procedure they determined I needed one stent as I was 80% blocked. Both the Interventionist Cardiologist and my electrophysic cardiologist and regular cardiologist have reccomended the Watchman be installed. I was currently on eliguis and baby asprin. After the procedure they added plavix and a clostereal med Astrostatin, I think. I am told that after a while I should be able to come off of the blood thinners. I am totally onboard with having it done, except when Boston Scientific called after my inquiry I said to them your adds say 9 our of 10 can come off of blood thinner. I also said what are true statistics as to how many have you installed and tracked had to stay on blood thinners as I would not want to go thru and still take the meds. I feel I am protected now but would like to come off of the blood thinners and Astrostatin medicines. Ten percent seems high. If I knew closely what numbers I could make inflormed decesion. I will ask my Dr’s the same question but would like to try and know most answers before my consultation in 2 weeks. Do you have any info as to what numbers might actually be. If possible can you email me your response. Im happy to respond here if you wish? The factors that determine the need to stay on anticoagulation are whether there is leak around the device and whether there is any evidence of clot seen at follow up. In my personal experience, i follow everyone up at 45 days after I implant the device and perform a TEE to look at these features. I am yet to see a clot on the device or a significant leak and have therefore been able to take everyone off the anticoagulation. If we look at contemporary data, the incidence of device related thrombus is in general <5%. The atorvastatin is a cholesterol medication and has nothing to do with the device. Implantation of the device is not an indication to start or stop a statin medication. Good morning! I would like to know if there is a maintenance that needs to be done after 6 months or so. Also how long has these procedures being performed? The watchman has been around for several years and experienced teams have performed this with excellent safety profile. After 6 months in the best case aspirin only is required and many patients can come off the plavix and coumadin. It is unfortunate that you and Boston Scientific have NOT been forthright and direct in your use of statistics: “several years”, “generally less than 5%” and “years and years” are generalizations, not statistics. You certainly have the actual answers to these questions – why are you not providing them? You’ve made an odd and bold set of statements and i don’t blame you for any assumptions. This is an entirely independent piece without compensation of any sort with the intent to educate. I don’t have a relationship with Boston Watchman as things stand nor do i seek one. Your welcome to email the company with regard to the statistics you seek which are of course an ever moving target as the real world experience and registries grow. Im not sure what your point is here on what was written as an educational piece for those who have heard of the procedure or who have been seen by doctors and still had questions. I would like to ask how long has these procedures been being performed and is there a need for regular maintenance check after? I would like to know the odds of successfully having this Watchman procedure done? If done in experienced hands and the anatomy is suitable as determined by screening testing the odds should be excellent. My husband was just referredfor the Watchman Procedure. He has had four TIA’s in three weeks. He was put on in 2012 Warfarin and had a PE within a month. He was then put on Lovenox. He developed afib and was taken off Lovenox and put on Pardaxa about six months ago. We (doc’s included) are wondering if the change from Lovenox to Pardaxa could have brought on the TIA’s. He does have high BP, has had for years. It is being controlled by medication. Has poor kidney function. The doc thinks he is perhaps the 1% that ‘blood thinners’ may not work. Do you know of anyone doing a ‘gene’ study that is studying/following patients with afib and failed control by ‘blood thinners’. We sure hope he is a candidate for the Watchman procedure. Do you think is could be a ‘fit’ for him? I know it may be impossible to know without having his case files in front of you. Thanks for your response. It seems to be a difficult situation and the first step in this case would be to consult with a neurologist and a hematologist. My question of the neurologist would be – has every possible cause of stroke been ruled out other than afib? and off the hematologist – is there a resistance to conventional blood thinning agents? In terms of the watchman procedure, its important to realize that it is in general meant for those who cannot tolerate blood thinner. There is no data to suggest a clear stroke risk reduction in those that are able to take blood thinner without significant restrictions or side effects. The watchman can technically be performed in most people however in terms of stroke reduction there will not be a lot known regarding the situation you have described. Whether to proceed or not is a decision that should be made by the implanting team in this instance. In general watchman is reserved for those that are not good candidates for anticoagulation. Also watchman is not able to be implanted in patients with active clots present in the left atrium. In order to have a watchman implanted he would have to restart anticoagulation and then have a repeat study in a few months to see if the clot has resolved prior to consideration of watchman. I think that your web page on the Watchman is by far the most informative that I have found. With all of the information you have provided, I think it would be great to have a “checklist” of all of the concerns that the doctor and patient would need to consider and would cover during the whole process from the beginning of initial considerations, to the preparations before, and all of the steps during the procedure. For subject matter of this importance, if there is not such a checklist in place at this time, I think there certainly should be one. I also know this would require a lot of work to put one in place and it should be known that it would be only a first draft and a subject for many amendments. To highlight a very small detail of the depth of information I am talking about…if there are 5 different sizes of the Watchman, how does the doctor determine the correct size, or during the procedure, at what step does the doctor perform the “tug test” and does this tug test procedure mean the same for all doctors? Etc. etc. etc. ! Glad you like the site, it was designed for such, I do a lot of these procedures and want patients informed. As far as a checklist goes, don’t concern yourself with it, rather choose a team you are comfortable with, with skills and experience. There are stringent and extensive checklists we use and criteria prior to releasing any device and i hope all teams to the same! Sizing is based on many factors but ultimately determined in the procedure itself after looking at the appendage angiographically. I am a 73-year-old woman who has had 3 a-fib. events in the past 8 years, one of which (2 years ago) was very serious and required several days hospitalization. I’ve been on Coumadin for 2 years and although my INR scores have been fairly erratic, I’ve done well on it until 4 weeks ago when I was diagnosed with bilateral subdural hematomas. I was in the NeuroICU of our local hospital for a few days and was sent home after 3 CAT scans, the final one upon discharge showed gradual decrease in the hematomas. Three weeks later, a 5th CAT scan showed the hematomas to have resolved. I believe the “trauma” that caused the hematomas was very aggressive head bouncing, shaking, and bumping by my hair salon while shampooing my hair! I had no falls, and I did not bump my head on anything. It is now a month since that incident, and I have been off of Coumadin the entire time. I’m anxious to resume anticoagulation therapy, but my two cardiologists (one where I live and one in FL where I vacation for 3 months) don’t seem to have a definitive recommendation on which anticoagulant would be best. The one in FL feels the Watchman device would be indicated, but the only “score” in the CHADZ2 scoring would be hypertension (which is being treated with Metoprolol and hydrochlorothiazide). While I was hospitalized, my BP was very high, and Norvasc was added, but during the past 3+ weeks at home, the Norvasc keeps my BP too low (102-108) many days. I also have diversion colitis as a result of a bowel perforation and subsequent colostomy, and when initially put on Xarelto after my first a-fib event in 2008, I had increased rectal bleeding, so of all the blood-thinner medications available, the ones being considered are: resuming Coumadin, or Eliquis or Pradaxa. I want to be sure there is a reversal agent available in the event of an emergency. Many factors to consider. It seems that I am left to decide on the best treatment, and I would greatly appreciate your opinion based on what I have told you. When it comes to the watchman device, the procedure is never an emergency and as far as i’m concerned as things stand there is never a firm recommendation. It genuinely depends on the conversation you have had with your implanting team and their opinions after hearing your full story. The watchman in my opinion isn’t an alternative to anticoagulation in candidates for such. Time will tell as to whether it is the first line treatment for those who cannot take anticoagulation. In candidates that have a good rationale to come of the blood thinner, and are at significant risk of an event, the device can be considered however its important that the patient understand that although theoretically an excellent option, there is not a watertight recommendation based on the data. was essentially 1 and a half years ago. He can only walk a few steps with a walker and just sits all day due to back problems that docs think is secondary to his prostate cancer. A doc has suggested that he have the watchman procedure. He doesn’t like the idea of anesthesia again. Should I encourage him to have the procedure or say no as his advocate. He is a very intelligent man and even largely responsible for the design of the first rocket engine to the moon and many other things I can not divulge. Move him and want the best for him, whether it is to let nature take its course or to encourage the procedure. What do you suggest? In such situations, as his advocate, its best to go with your gut. The watchman procedure is not an emergency procedure and not a procedure i personally push at all in those that are undecided. Just with the little i know from your very nicely worded question, unless you are sure its something you want for sure it may well be best avoided particularly if there is a wish to avoid anesthesia, and given his advanced co-morbidities. In this situation any procedure that does not directly improve his quality of life should probably be avoided. My husband had the watchman installed everything went well. Six days later he had an afib attack. Now he is afraid that the afib may have made the watchman move out of place because of the rapid heart rate. Can that happen? No it wont make it move out of place. My mother is 84 years old and out of rhythm (arrythmia?) 88% of the time. Has high risk of lung bleeding due to COPD. She cannot take blood thinners due to bleeding risks in lungs. Would the Watchman device help with the heart arrhythmia or is it only to reduce the risk of stroke from the arrhythmia and the lack of blood thinners? I would recommend that she is evaluated in an experienced watchman center to discuss suitability, pro and cons. What happens to the blood that is trapped behind the Watchman? It clots off. The watchman seals it. The watchman is then covered with the inner heart lining over time. What are the risks involved with the clots left since they can’t get through the watchman?? The clots typically form in the appendage so the watchman would theoretically stop them forming or escaping. The area sealed off will likely clot off over time, the watchman ideally seals the entire appendage chamber off. Dr. Ahmed, my Mother is 75 year old, hx. Of 1 event of CHF due to a fib. EF who now. No other comorbidities. She has had 3 ablations & loop monitor placement due to complaints of SOB & chest discomfort. Her current rate & rhythm are WNL. She is tolerating eliquis well. At yearly check-up her primary cardiologist said she was doing well from his perspective but he shared that the cardiologist who did her 3rd ablation felt strongly that she should have the watchman placed. Both MDs within same group. His rationale was that he felt he may have went too far into the left atrium during the ablation and effected the function of the LAA. Is this a reason for invasive procedure for someone who is in NSR now and tolerating anticoagulation without issues? Based on what you said, i personally wouldn’t at this stage offer the watchman in this setting particularly if anticoagulation well tolerated. Dr Ahmed, so glad I came across your site. My 86 yr. old mother has had two bleeds in her eye twice within the last 6 months. The latest pretty severe. Has been on Xarelto 15 mg. for a couple of years due to afib (possibly due to previous alcohol abuse). Her cardiologist has recommended the Watchman device. She is fairly healthy for her age, taking meds for hypertension, hypothyroidism. She also takes a low dose of prednisone every other day due to severe environmental allergies. Just started my research, and would like to know the risks with the procedure and subsequent possibilities. What’s your thoughts? The decision will be my mother’s to make. I would like to support, but be educated. Many think the watchman is an effective alternative to blood thinning medicines in those that cant tolerate blood thinning medications in the long term and have good reason to seek alternatives. Some feel the jury is still out in the long term. Regardless, when it comes to stroke prevention strategy, it is an approved method and widely offered and hopefully over the next few years the data becomes more clear. In terms of risk, the main risk would be procedural, in experienced hands this risk should be very low. In our center, safety and success rates of the watchman has been excellent. I’ve been told to stop blood thinners after approximately 6 months due to a bunch of otherwise mysterious bleeds including painful internal hemorrhage in calf with walking painful after several weeks. Taking them for occasional silent paroxysmal a fib. Longest known incident 2 hours in 2 week monitoring period. Will have consult re watchman. Was concerned to read here if need for 6 months Coumadin after Watchman implanted. Seems counterintuitive in my case—-cure involves what caused the need for it. You say that in future Coumadin may not be necessary in this context. In my circumstances would it be reasonable to wait till then? I am nearly 76 years old, female,. A fib only noted after segmentectomy of lung last year. I would recommend to have the evaluation and see the protocol used by your treating team. Under current approval the anticoagulation with coumadin is typically recommended for 45 days however patient safety is of course the key factor and may differ during treatment plan as necessary. I have genetic issues of being a non expressor of all anticoagulnts including plavix nd warfarin xarelto and eliquis. Eliquis ia causing stomach ulcers. Should I consider a Watchman and if so what would i take for the 45 days after? Clearly the situation with regard to your anticoagulation issues is somewhat complex. You should bring these questions up with a Watchman team who would complete a full evaluation and present you with the best options. They would have to review your history and determine your risks of differing anticoagulation regimens after likely Consulting with a hematologist. Thereafter your candidacy for a device can be determined. Could you please explain the rationale for requiring Plavix (with aspirin) for 6 months following the Watchman implantation? Also the benefit of Plavix over Coumadin? My dad had a watchman procedure done in August, 2017. Prior the watchman procedure in July his blood work was completely normal. The procedure went well and he is now on baby aspirin and plavix but he has anemia due to iron deficiency. Could it be because of watchman? The device itself shouldn’t cause anemia. I would certainly bring up the issue with your watchman team however particularly if he is on aspirin and plavix and the anemia is new. From a watchman standpoint, as per current protocols, after 6 months, most patients take aspirin alone unless plavix indicated for some other reason. Can I take a flight overseas three months after having the watchmen? The device itself is not a contraindication to flying. noisy. I can hear it at night and during the day as I go about my life. This is almost certainly not related to the watchman device. my heart beat stays normal for me even on the tread mill. I don’t want it but my heart doctor is pressuring me into it. He said that my INR tests are either too low or too high and doesn’t want to deal with it. I think in the year that this started I have only had two within the range. Should I seek another heart doctor? After reading all this good information I am scared to death. I wish I knew why I can’t get the INR test within range. I did have a bleed recently on my leg and foot. I am 82. If you don’t want it don’t do it. Its not that a Dr should ever pressure you in to a procedure, rather a discussion of risks and benefits and the rationale behind proceeding be fully understood. If you aren’t happy with that, seek a second opinion. I am a 75 year old woman who has had afib, tea and then conjestive heart failure due to Pneumonia 2 years ago. I take warfarin now which is not easy to keep at 2. My hands bruise terribly with big red mark just from touching something. I love sports and do several. Would I be a candidate for a Watchman even though I have had a fairly successful oblation? I take Tikosyn and Diltiazem to stay in rythm and keep the heart rate down. You should seek evaluation and an opinion from a Watchman team to discuss further. I live in North Carolina and my Electrophysiologist is Dr. Landers at Reidheart hospital. Do I start with him to get an evaluation or do I look for someone on my own through you? I am in Birmingham Alabama, outside of our practice we don’t offer referral services at this point to other specific hospitals. If you want to stay local maybe start with your electrophysiologist. thank you for the reply. I contacted my Electrophysiologist and they said point blank they do not do the proceedure here in Pinehust but it is done Charlotte NC. I have a friend who has had a successful Watchman proceedure done in Texas and I may get names from her. She said her surgeon goes around the world teaching the proceedure. Do you feel there are any age related considerations that should be addressed in making the decision to get the procedure? As things stand, the decision is made based on risk of bleeding and risk of stroke. Age is not necessarily a consideration, rather it just happens that a more elderly population is typically treated since they have a higher risk of stroke and are more likely not to be able to tolerate blood thinning medication and thus seek alternatives. How can one know if they are going to be allergic or sensitive to the components used in the Watchman device? I am a 74 year old female with persistent AFib, am scheduled for an ablation procedure in 3 weeks, with a Wachman to be implanted a week later. I have an unruptured basilar tip brain aneurysm which has been coiled 3 times. Now has a total of 16 coils and 2 stents and my endovascular neurosurgenn does not want me to be on long term anti-coagulants. I am not aware of instances of allergy after implantation. I love your website! Question: If a patient reports contact dermatitis from wearing nickel jewelry (ear rings), would that be a contraindication to having the Watchman procedure (because it contains Nitinol)? Thats a great question, i’ve never heard of a clinically significant allergy after implantation but would recommend emailing the company for clarification. The watchman is entirely independent from the pacemaker and will not interfere. With regards to candidacy the next step would be to seek a referral to to a watchman team for evaluation or to discuss pros and cons of having the procedure. I will be getting a TAVR next week, and because of internal bleeding, I have been taken off Coumadin. A Watchman device has been recommended to be implanted after the TAVR procedure. Could you please tell me how long I must wait after the TAVR before I can get the Watchman device? Depends on the local team, no real reason for a significant delay. My grandmother had the watchman a couple of months ago. She is past the 45 day window for being on blood thinners. They chose to place her on Plavix and Aspirin daily. When she went to her follow up appointment at 45 days they told her she would have to continue taking the blood thinners for 6 more months but didn’t explain why. She is upset that she has to continue taking these as this is one of the biggest reasons for her having the procedure. Why would she need to continue taking them at this point? The current protocol (which should be discussed at length prior to the procedure) is aspirin and coumadin for 45 days, then aspirin and plavix till 6 months, then aspirin alone, all being well. My father had a Watchman put in about 10 months ago. It has not epithelialized and is leaking. He has had 3 TIAs during this time. The doctor wants to go back in and put a ring in to seal off the leak. However, he has never done this before. My father has poor tolerance for blood thinners long term and would like a fix for this. Any articles or resources for such a situation? I would need to know more about specifics of the report and the approach being suggested to comment usefully. This certainly needs to be discussed at length with the implanting team. My mother-in-law (76 yo)saw a new cardiologist for opinions on managing her a-fib in a patient on Warfarin with 3 significant GI bleeds, the most recent 2 weeks ago and a hard fall (one week ago). When she was taken off the Warfarin earlier this year for abdominal surgery (off for 10 days total) by day 11 she had her first stroke. In all she had 4 infarcts. The new Cardiologist is sending her to a specialist to determine the benefit of the Watchman’s device. A Cardiologist friend of mine mentioned to also look at the Lasso procedure. I just started researching both as we wait for the appointment. Would you be able to direct me to studies so I can become more knowledgeable and know what questions to ask. Thank you. Im not familiar with the lasso procedure, do you mean the lariat? The watchman is certainly more well known and performed. Questions should focus around risk to benefit of the procedure, team experience and outcomes, and post procedural protocol. Do Watchman devices ever get infected? My now 79-year old husband had a watchman implanted about 5-6 years ago. Evidently it leaked three years ago, because he had a major stroke which has now led to Alzheimer’s. He has had intense left-chest pains for five days now. Doctors have done blood tests, EKG, chest X-ray, etc and cannot find anything wrong. Despite three ablations, the Watchman and Warfarin, he continues to have frequent Afib. However, since the chest pains began five days ago, no Afib. Docs are giving him Flexeril, Augmentin and Gabapentin in addition to the Dofetilide he has been taking for three months. The pain persists (about 1-4 times a minute, each for a few seconds). He can’t sleep and his mind is all confused, walking is not steady. Any ideas, please? I have not personally seen an infection from one, however theoretically its possible, fever would be a main sign as opposed to chest pain. Pain 6 years later would be unlikely. Let your watchman team know so they can advise you. My father is 82, has a-fib, hypertension, diabetes, has history of stroke & 6 bypasses in the 1990s. He has been on Xarelto. He is bleeding internally & has had blood transfusion & iron infusion. He had blood work done & he is continuing to bleed. My question is: Is it recommended that he discontinue Xarelto & be placed on an 81mg of aspirin until he has the watchman implanted? Thank you. Would depend on the risk to benefit ratio of stopping the anticoagulation. This needs to be determined by the treating team. As per the current watchman protocol most patients will need to be able to take coumadin after the procedure for 45 days. 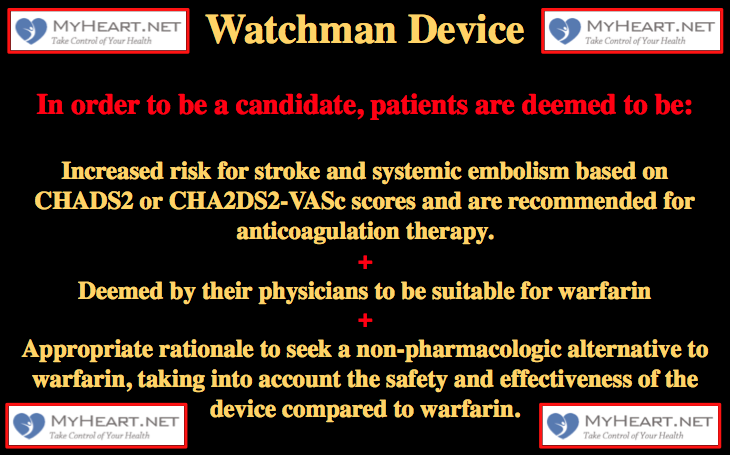 Can a patient with an ICD have a Watchman placed? Why do I have take coumadin 2 weeks bfre surgery for watchman?I take plavix,and took xarelto and eliquis at one time, but had bleeding issues. Im not sure why before, maybe they are testing whether you can actually be on it or not since as things stand patients should be placed on coumadin for 45 days after the implant. My 76yr mother’s cardiologist has recommended she be considered for this procedure. She has been on Coumadin for her Afib for several years but in the last few months her INR has been quite erratic. While what I have read so far sounds encouraging, I am concerned because it is not as widespread yet as I would’ve hoped (my mother saw a pamphlet in her Dr’s office and inquired – not because he suggested it on his own). I worry because she already has quite a “laundry list” of health issues that I don’t want to add anything to that list (CHF, diabetes, COPD, hypertension, edema) She has a pacemaker (approx 9yrs) & had a nodular abalation 2yrs ago – has been on Plavix since and has had anemia off & on (since the start of Coumadin) that requires her hematologist to give her a iron booster shot every few moths. I just want to know what issues we should be really focusing in regards to her current health when we meet with the surgeon for consultation on this procedure since she has so many already. General anesthesia for this procedure is of concern since she has COPD (not on oxygen) but I read that there may be other options. I appreciate any advice – and I am now following you on Twitter! The most important part of the procedure is the pre procedural evaluation. The key is to use a team with a full heart team approach, and not just one where the only evaluating physician is the implanter. You should be seen by an implanting and a non implanting physician ideally. Importantly the evaluation should determine whether you are a candidate and would likely derive benefit, then discuss the risks and benefits and ensure it is felt that the benefit outweighs the risk. The risk of anesthesia will be determined by the anesthesiologist. Its important to be fully comfortable prior to agreeing to the procedure as there is always a risk with any invasive procedure. My mother passed away due to complications from surgery of Watchman implementation. Watchman appears to be a good idea, however, make sure you have at least 2 informed opinions of your health and the need for the watchman. Due to her inability to hear well, I seriously doubt that she was thoroughly informed and understood the issues. I am a 79 year old female who was diagnosed with afib over three years ago. I have been on Eliquis for the past three years. I was put on Eliquis over coumadin as my favorite vegetables are spinach, broccoli, and sprouts, also I live in the boonies and going for blood tests was difficult after surgeries (at that time I was scheduled for hip and knee replacements). I have hypertension, COPD, half a thyroid and one parathyroid removed all treated with meds. I am scheduled for an echocardiogram and then we are going to consider alternative to meds for afib. I saw a Watchman on tv and want to consider it with the doctor. My question is can Eliquis be used instead of coumadin before and after the procedure. In general people are advised to follow the protocol which would be 45 days of coumadin since that was used in the approval studies. Any deviation from that although possible would need to be discussed with the treating team. I recently had the watchman put in by a physician I highly respect. I am 76 and have MS and other problems and it had been a struggle to keep it down. I try very hard not to stress and bring on a MS relapse. Can this be a pleasant side affect of my watchman? The watchman is not known as things stand to have an effect on blood pressure. my question is….Can the Watchman aggravate the heart in such a way as to cause a recurrence of her Afib? Great question. In general it has not been an issue with device implantation. It shouldn’t lead to alteration in afib characteristics. Can the Watchman be removed? Not once it has been released in to the appendage. In general i have not seen it to where i have had to do further procedures. My husband with A Fib had an ablation 8 months ago and a pacemaker insertion just over 4 months ago. He was put on Tikosyn sling with his continuing Amlodipine, and his electrophysiologist switched him from Coumadin to Xarelto earlier this year. My husband suffered a hemorrhagic stroke 7 weeks ago. After 4 weeks in acute rehab he is home and doing well though struggling to recover speech. We just saw his electrophysiologist today, for the first time since this event. He was out if the country for a while. Almost immediately the doc blamed the hemorrhage on the Xarelto which was stopped immediately in the ER due to his brain bleed. He told me to stop giving my husband Heparin injections and justvstart baby aspirin, a thing the hospital staff had mentioned for his future. But then the doc immediately suggested the Watchman Device. Is this an appropriate response to a hemorrhagic stroke? The watchman was suggested an an alternative to blood thinner in a patient that is not a good candidate for long term use of blood thinner due to the risk of hemorrhagic stroke. It is important to discuss the post procedural blood thinning regimen with the treating team however. Since watchman is made of a metallic frame, could it be affected or interfered by electrocauterization during endoscopy procedures or surgery? Not a factor we are generally concerned with. I am a 79 year-old female. I had a colostomy in 2010 with complications that resulted in a 6-month nursing home stay. Then in 2016 I developed non-hopkins lymphoma treated with heavy chemo. Also had a skin cancer removed. December of 2017 I had a basel ganglia and intracranial stroke, apparently having been caused by eliquis and also stress since my husband passed away the week before. I have had a-fib for a long time-first felt my heart skip a beat back in the late 50’s. Now the watchman procedure has been recommended. I cannot decide if this is absolutely necessary and I am also terrified of anesthesia. Is there any other options to using a full-out sleep anesthesia. There are some sites that may offer watchman implant using ICE guidance that will not require full anesthesia, most however would use TEE guidance and full anesthesia. The recommendation for watchman is to provide a mechanism of stroke prevention in those not candidates for blood thinner. The watchman procedure is certainly not classed as an absolutely necessary procedure. My mother is 63 yrs old and has had 2 major bleeds recently and the 2nd one was so bad the doctors basically said she almost bleed to death. They did extensive testing as she was in the hospital for 5 days and they couTldn’t find the bleed. They told us her bleeding was due to Pradaxa and they have now put her on Eliquis. It has been 2 mos since her last hospitalization and her blood count has dipped down to 7 again. My mother has a history of congestive heart failure and has had multiple stents placed into her arteries. I’m researching this procedure and wonder if she would be a great candidate for it. I believe she has a sensitivity to any blood thinners, will she be a good candidate being that she would have to take Warafin for 45 days post op. She may well be a candidate, i would suggest she is evaluated by an experienced watchman team. I had my watchmans put in August of 2015 and had a TEE 6 weeks after and all was good. I just had another TEE and there is blood passing the device. My doctor contacted the company and they said that should not happen. I go back the end of February to find out what the next step is. What type of questions and do you know what I need to do. I assume they are talking about a leak around the device. This is not common. In general management of these depends on the size of the leak, if it is less than 5 mm it is felt to be non significant, if greater than this the treating team may choose to place you on blood thinner for an extended time or perform closer follow up or such. I’m 56 years old and can not take blood thinners, my doctor thinks I’m a good candidate for the watchman. My Afib is controlled very well with flecainide. I took Xarelto and it mess up my arms and made me bleed from the bottom. That was over 3 years ago, I can bleed easy without anything.